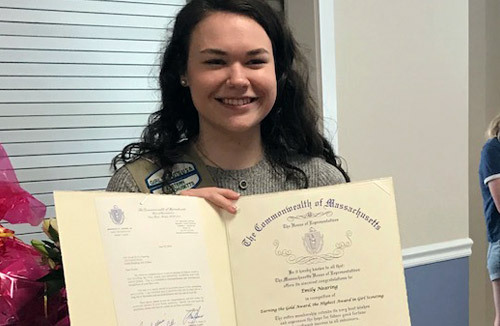 Braintree and Reading, MA (July 9, 2018) – A project facilitated by Emily Nearing and implemented at Peter Sanborn Place, managed by full-service real estate and property management firm Peabody Properties has earned the North Reading High School student a Gold Award from the Girl Scouts of Massachusetts. Girls in grades 9-12 must spend a minimum of 80 hours (over one or two years) working on a project, completing seven steps. First, the aspirant must choose an issue to address. Then she investigates, recruits volunteers to help, creates a plan, and presents her plan to her local Girl Scout council. Over the past year Nearing implemented a monthly communal meal free of charge to residents of Peter Sanborn Place, a community for seniors ages 62 plus and for persons with disabilities under the age of 62. She and team volunteers Allie Haskings and Monika Stancheva worked with local eateries and formulated a yearly calendar whereby a local restaurant is assigned a single month each year to donate a meal for 35 people. Nearing successfully accomplished her goal in completing the sustainable project – and earning a Gold award, the highest Girl Scouts honor – but also experienced and will continue to take pride in the powerful impact the intergenerational project has left on the Peter Sanborn Place community. “What better way to showcase this amazing young woman and her accomplishment than by thanking her right in the spot of this endeavor,” said Marcy Brown, Resident Service Coordinator at Peter Sanborn Place, noting that Michele DuLuca from the office of State Representative Bradley H. Jones, Jr. presented Nearing with a citation.